Advil, Aleve, Benadryl, Cipro, Darvon, Flonase, Lipitor, OxyContin, Paxil, Prozac, Tylenol, Valium, Zantac, Zoloft. That’s not the inventory of your local pharmacy. They’re just some of the buffet of drugs found in the tissues of juvenile chinook salmon in the Puget Sound, along with cocaine, caffeine and nicotine, according to the Seattle Times. The culprit wasn’t an aquatic drug dealer, but rather wastewater discharge. Estuary waters are close to the outfalls of sewage-treatment plants, and the effluent sampled at the plants contained a mix of 81 drugs and personal-care products. The levels were some of the highest in the country. Reasons for the extreme levels are debatable. Jim Meador, an environmental toxicologist at the National Oceanic and Atmospheric Administration’s Northwest Fisheries Science Center in Seattle, surmised that people in the area use more of the drugs detected in the fish. The processes at the wastewater treatment plants could also be a factor, he added. Samples for 150 compounds were analyzed, and 61% were detected in effluent, said Meador, lead author of a paper on the findings published in Environmental Pollution. Researchers say that the study could be underreporting levels of drugs in water closer to outfall pipes and in deeper water. Fish tested in the Nisqually estuary near Olympia, Wash., were also found to have high levels of chemicals, and those waters receive no direct discharge from treatment plants. The discovery even made its way to the late night comedy circuit. 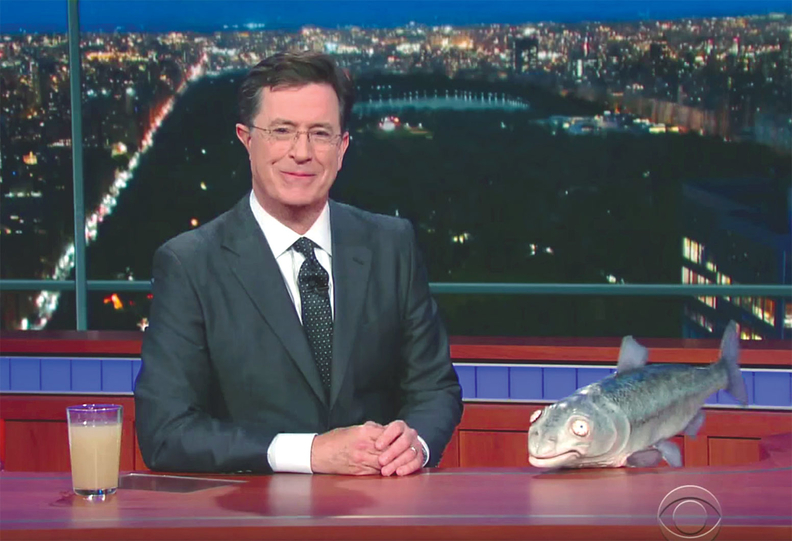 “The Late Show with Stephen Colbert” did a bit with “Sammy the Salmon,” a fidgety fish puppet with bloodshot eyes. “If I spent my life swimming in wastewater, I would definitely need a mood stabilizer,” Colbert quipped.